certain laws apply to all employees working in an establishment, without distinguishing the category of employee. Indian employment laws are highly protective of workmen and it can be a challenge for employers to comply with all applicable laws, some of which date back to the 1940s. The labour laws require an employer to act in accordance with multiple regulations, which include obtaining registrations, filing periodic returns, maintaining various registers and displaying extracts of specific laws. Compliance with these regulations can be tedious and problematic, as the information is usually voluminous and an employer may have specific internal methods of maintaining it. India is a federation of states. The Constitution demarcates the areas where central (federal) and state governments can legislate. Most employment laws are federal. These include laws relating to employment disputes, social welfare benefits, etc. States are generally empowered to pass amendments to these laws, with specific local applicability. The Industrial Disputes Act 1947 (the ID Act) is the main central legislation dealing with workmen. A workman would generally be any employee, inter alia, engaged to do any manual, unskilled, skilled, technical, operational, clerical or supervisory work for hire or reward, but would not include an employee engaged in a managerial or administrative capacity; or in a supervisory capacity and receiving wages of more than 10,000 rupees per month. Typically, all employees who are not in a managerial or supervisory role would be considered workmen. The main piece of legislation that is usually enacted by a state is the Shops and Establishments Act (SEA). This law deals with issues such as working hours, leave and overtime. Complaints involving industrial disputes fall under the ID Act, which provides for various adjudicatory bodies, including jurisdictional conciliation officers, labour courts and industrial tribunals, to resolve disputes between workmen and management. An employer and workmen may also agree to refer an industrial dispute to arbitration under the ID Act. Further, the High Courts of the states3 and the Supreme Court of India4 (India's apex court) also have jurisdiction to hear certain labour disputes under constitutional law. Litigation in India is often drawn out and the duration of an industrial dispute is difficult to predict with certainty – it may range from six months to over two years. The dispute process varies for employees who are non-workmen. In this case, the remedy would be mainly for breach of the employment agreement, where the parties have the option to approach the jurisdictional civil court (which includes the state High Court) for relief or the appropriate authority under the SEA. As part of its objective to make it easier to do business in India, the government has proposed that the most important central labour laws be revised and possibly amalgamated into two or three labour codes. If this is implemented, substantive procedural requirements relating to compliance and filing will be streamlined. Amendments have also been proposed to federal laws relating to factories and the use of apprentices. As a precursor to federal legislative changes, certain states in India, including Rajasthan and Maharashtra, implemented changes to their state laws relating to industrial disputes, factories and contract labour. In March 2018, the Payment of Gratuity Act was amended, doubling the gratuity ceiling from 1 million rupees to 2 million rupees, bringing employees in the private and public sector on par with central government employees. Another significant amendment was the inclusion of a female employee's statutory maternity as per prevalent law (now being 26 weeks) in the employment term for calculation and payment of gratuity, from the previous period of 12 weeks. Another significant change is the beginning of unionisation in India's IT sector (see Section IX.iii). This sector has been one of the key drivers of India's economy, with governmental scrutiny into compliance being somewhat less intense. Unfortunately, this has caused certain employers to adopt unhealthy work practices towards employees, such as not paying the required overtime, encouraging excessive work hours and not following statutory requirements for termination. Employees have expressed dissatisfaction at these aspects over the past few years. Under the Employment Exchanges (Compulsory Notification of Vacancies) Act 1959, if notified by the concerned state government, a private-sector employer with 25 or more employees is typically required to notify any vacancy to a local government employment exchange 15 days before the date on which applicants will be interviewed. In practice, this is often observed in the breach. There is no central statute dealing with the issue of an appointment letter or employment contract. Certain state-specific statutes may require the employer to issue an appointment order in a specified format. In practice, most companies provide an appointment letter or an employment contract indicating the join date, position, compensation and general terms of employment. Typically, the compensation break-up is mentioned in an annexure, which can be modified as required. The compensation break-up is largely based on the taxation aspects of the different compensation components. Companies would also have an employee handbook or manual, with details of company policies relating to discipline, leave, etc. In addition, it is quite common for companies (especially in the IT and R&D sector) to enter into confidentiality and non-disclosure agreements separately. If the employer wishes to amend the employment terms, he or she would need to check whether the employee is a workman. For workmen, the ID Act prescribes a specific process to be followed for change in specified working conditions (e.g., wages, working hours), including provision of prior notice of 21 days. 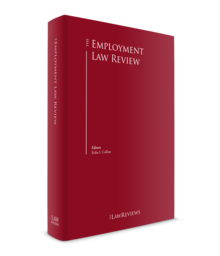 For a non-workman, it is recommended that the employer obtain consent of the impacted employee to effect the change, as a unilateral change to the employment may be held as arbitrary and void. There are no direct laws dealing with probation on a general basis in India; however, this is a common practice. The (federal) Industrial Employment (Standing Orders) Act 1946 (the IESO Act) regulates working conditions for workmen and generally applies to industrial establishments employing 100 or more workmen.5 Under the IESO Act, a workman can be employed on a probationary basis to provisionally fill a permanent vacancy up to a maximum of three months. Any such probationer is not entitled to dismissal notice or payment in lieu during the probation. Certain states (such as Maharashtra) have built the concept indirectly into the SEA, by requiring an employer to provide termination notice if the employee has worked for a specific duration (in Maharashtra, three months). No notice is required if the employee has worked less than this period. Typically, a probation period lasts between three and six months, and should ideally not exceed 240 days, as several statutory social welfare laws apply to employees who have worked for this period and a probation period exceeding this limit may be construed as a method to avoid complying with the law. It is generally accepted that the services of probationary employees can be terminated at any time by either the employer or the employee as per the terms of the employment contract. Hiring of employees requires the establishment of a legal entity to do business in India. There are various routes to set up a legal entity, such as establishing a company, a branch office, a liaison or representative office, or a limited liability partnership. Until the legal hiring entity is set up, if a foreign company wishes to get people on board, it can examine options like entering into an independent contractor agreement or using a manpower agency as a temporary measure. The use of an independent contractor, especially in relation to the duration of the contract term, would need to factor in possible adverse tax implications on the foreign company by way of having a permanent establishment in India. Multinational companies in India often do not hire direct or regular employees for ancillary services, such as security, housekeeping and catering. A company would usually hire a contractor to provide such support services and the provision of labour by such a contractor would be regulated by the Contract Labour (Regulation and Abolition) Act 1970 (CLRAA). The CLRAA envisages registration of the principal employer and licensing of a contractor. A principal employer is any person responsible for supervision and control of an establishment, namely, the company hiring the contractor. It is the responsibility of the contractor to make timely payment of salaries and other emoluments to the contract labour. A key aspect of the CLRAA relates to defaults in the statutory obligations of the contractor – in such case, the principle employer may need to make good the defaults (which can include payments) to the contract labour and subsequently recover the same from the contractor. A principle employer should ensure that the contractor undertakes and is liable to comply with all statutory obligations for its personnel. Restrictive covenants in the form of non-compete and non-solicitation clauses are frequently included in an employment agreement. Strictly speaking, a blanket non-compete clause post termination of employment would not be enforceable under Indian laws as it would be held as a 'restraint of trade', but is usually included for deterrent value. Non-solicitation agreements post termination of the employment relationship may have limited enforcement between two employers but not against the employees per se. The law on non-solicitation agreements is not very well developed. It is possible to have employees sign an employee bond – if the employee is provided with substantial training at significant cost, the employer can require him or her to remain with the organisation for a reasonable period. If the employee leaves prior to the expiry of this period, he or she may be required to repay the actual or reasonable costs incurred by the employer for this training. The Minimum Wages Act 1948, the Payment of Wages Act 1936 and the SEA generally govern the payment of wages to employees. The Minimum Wages Act stipulates the minimum rates of wages in certain employment. These rates differ from state to state and are periodically revised. The Payment of Wages Act regulates the payment of wages, including method and period for disbursement to employees earning up to 24,000 rupees per month. The SEA usually provides for working hours, which average around eight to nine hours per day. The SEA in most states provides for a break of 30 to 60 minutes after four to five hours of work. Any work beyond this limit would warrant overtime payment, which is usually twice the average wage. The SEA may also provide for overtime caps, usually on a daily, weekly, monthly or annual basis. There are no exemptions from paying overtime. However, overtime provisions are often observed in the breach, as companies may not pay overtime when employees stay late by their own volition to complete work. Ordinarily, companies need to adhere to government norms on opening and closing hours, and need to be closed for one day a week. As per standard business practice, this is usually Sunday. Exceptions have been made under the SEA for certain sectors, such as the IT and IT enabled services (ITES) sector, for which specific permission is required from state labour authorities. Female employees are generally not permitted to work at night (8pm to 6am) for safety reasons. Some state governments provide exceptions for sectors such as IT and ITES, for which specific approval has to be obtained from the labour authorities. Any such approval is subject to stringent security conditions. The Factories Act is the main central law dealing with factories, distinct from 'regular' commercial establishments. The Factories Act provides for working hours for factory workers (a maximum of 48 hours a week or nine hours a day, or both), overtime (usually at twice the ordinary rate of wages), leave, etc. Other relevant features of the Factories Act are detailed safeguards for the health of factory workers, safety, improvement of physical conditions of the workplace and welfare amenities. Typically, the SEA provides for about 15 to 20 days of regular leave and about 10 national or public holidays. Some national holidays are compulsory, while others may be chosen out of a larger list of holidays notified by the state government. An employer may be required to provide statutory social welfare benefits to its employees according to various central legislation. The main legislation includes the EPF Act, the Employees' State Insurance Act 1948 (the ESI Act), the Payment of Gratuity Act 1972 (the PG Act), the Bonus Act and the MB Act. The EPF Act automatically applies to establishments that, inter alia, employ more than 20 people and to employees who earn up to 15,000 rupees per month. The employer and employee are required to make contributions to various funds (provident, pension and deposit-linked insurance) for the benefit of the employee. As a matter of practice, companies often provide this benefit to all employees regardless of their monthly compensation. If a company chooses to voluntarily follow the EPF Act, it would need to comply with all requirements thereunder, including in relation to contribution caps and filings. Companies with foreign employees and companies sending Indian employees to work overseas would need to factor in the concept of international workers under the EPF Act, where a higher amount of the employer's contribution typically needs to be deposited in the provident and pension funds as compared with 'regular' Indian employees. The ESI Act applies to factories, which are defined as establishments engaged in manufacture with the aid of power with 10 or more employees. In establishments engaged in manufacture without the aid of power, 20 or more employees are required for the ESI Act to apply. The central government may also notify other establishments to fall under the ambit of the ESI Act. According to the labour authorities, the ESI Act is applicable to all establishments. However, there is some ambiguity on this. The ESI Act aims to provide proper medical facilities and insurance to a workman and to his or her immediate family through a contributory fund. All employees, whether employed directly, through a contractor or part-time, who receive a salary of up to 25,000 rupees per month (with effect from 1 January 2017) are entitled to be insured under the ESI Act. The employer and the employee are required to contribute a specified percentage of the salary, which is deposited by the employer in the Employees' State Insurance account. Gratuity under the PG Act is a lump sum payment made to an employee on retirement, death or termination of employment because of disablement. Other than in the case of death or disablement, it is required to be paid to employees who have completed five years of continuous service. The requirement to pay gratuity applies, inter alia, only to an establishment in which 10 or more people are employed and applies to all employees regardless of monthly remuneration. Gratuity is determined at a rate of 15 days' salary for every year worked or part thereof in excess of six months, capped at 2 million rupees. The Bonus Act applies to every establishment with 20 or more employees during an accounting year. An employee receiving a salary of 21,000 rupees per month or less is entitled to a bonus for every accounting year if he or she has worked for at least 30 working days in that year, inter alia, on the basis of profits, or on the basis of production or productivity. The minimum bonus is 8.33 per cent of the salary earned by an employee during an accounting year, or a sum of 100 rupees, whichever is higher. The Bonus Act also provides that the maximum bonus payable to an employee should not exceed 1,400 rupees (or minimum wages, whichever is higher). The MB Act provides for paid maternity leave and other benefits (such as a maternity bonus) in relation to childbirth, medical termination of pregnancy, miscarriage, etc. A female employee is generally entitled to 26 weeks of paid maternity leave up to two children and 12 weeks of paid leave for more than two children. Paid maternity leave is also available for cases of adoption of a child up to three months old and in cases of surrogacy. The law prevents a female employee from having her employment terminated if she is on statutory maternity leave. As mentioned in Section V, a significant difference between Indian and foreign employees is highlighted in the EPF Act. The threshold to qualify, the manner of deduction and the benefits differ for a foreign employee, and differ further depending on whether the country of origin has a social service agreement with India. There are no other substantive distinctions between local and foreign employees. Immigration issues in India are regulated broadly by federal laws, with input from the Ministry of Home Affairs and Ministry of External Affairs. While the tourist visa-on-arrival provision has been introduced for a limited number of countries (such as Singapore and Finland), work-related visas typically need to be applied for well in advance. To stay in India and work long-term with an Indian company, a foreign national requires an employment visa, unless he or she already holds a valid Overseas Citizen of India card, which is granted to certain foreign nationals of Indian origin. To be eligible for an employment visa, a foreign worker must earn a salary of more than US$25,000 per year and should not be appointed to a job for which qualified Indians are available. A separate category of business visa exists that is issued only for a short-term purpose, such as a visit to India to explore possible business ventures. Foreign nationals are generally required to register with a jurisdictional Foreigners' Registration Officer or Foreigners' Regional Registration Officer, within 14 days of their arrival in India if they hold a visa for more than 180 days. Given the fluidity of international relationships, it is recommended that before any foreigner travels to India, he or she should seek specific advice on the type of visa he or she needs to obtain. While most companies would have an employee handbook or manual dealing with issues under the IESO Act, it is advisable to check whether there are any state laws that require the company to actually adopt the format of the standing orders under the IESO Act. State laws may require statutory employment-related documents to be maintained or displayed in the local language or the language understood by the majority of employees. An employment agreement would not need to be framed in this manner and is usually in English. What is important is that the employee should be able to understand all employment-related documents. Under the ID Act, if an industrial establishment employs 100 or more workmen, the government (state or central) may require the establishment to constitute a works committee with a maximum of 20 members. The works committee needs to promote measures for security and good relations between the employer and workmen, and to mediate or facilitate any material difference of opinion between the parties. The committee would consist of an equal number of representatives nominated by the employer and workmen. The legal right for collective bargaining exists in India through the means of a trade union. A trade union may be formed in accordance with the Trade Unions Act 1926 for regulating relations between an employer and employees. For the purpose of registration, seven or more members of a trade union can subscribe their names to the charter of the trade union and apply for registration of the trade union. A trade union is entitled to enter into binding contracts and settlements with an employer. In practice, white-collar employees are usually not represented by a trade union or any other collective bargaining unit. Further, trade unions are largely absent in services businesses, including, in particular, India's large IT and ITES sector, though there is some movement towards forming trade unions in the IT sector. Certain states in India have laws dealing with trade unions, such as the Maharashtra Recognition of Trade Unions and Prevention of Unfair Labour Practices Act 1971 and the Kerala Recognition of Trade Unions Act 2010. In November 2017, the Labour Commissioner of Karnataka granted certification for the creation of the first trade union (Karnataka State IT/ITES Employees Union (KITU)) of IT employees under the Trade Unions Act 1926, and the Karnataka Trade Unions Regulations 1958. The agenda behind the formation of KITU is the following: to organise employees working in the IT sector in Karnataka; to act as a platform for those employees to voice their grievances; and to provide a medium for interaction with the employers. There has been considerable backlash from employers to this, mainly on the grounds that unionisation in the IT sector will hamper business operations and create an uncompetitive environment. The authorisation for creation of KITU has resulted in a ripple effect across India. In January 2018, Maharashtra registered its first trade union for IT employees – the Forum for IT Employees – with chapters being opened in Karnataka, Tamil Nadu and Karnataka. There is no requirement for an employer to register with a data protection agency or other government body. Background checks are a common feature that employers in India generally follow before hiring anyone, and successful completion of these checks is a precondition to employment (and continuing employment) with the company. Often, employers retain the right to conduct background checks on existing employees in case it is required for business purposes. There is no prohibition on conducting background checks on employees, including candidates, provided their consent for this has been obtained. Background checks could include verifications on education, criminal history, credit rating, etc. The most common background check is of academic credentials, which is typically outsourced by an employer. Criminal verifications are becoming somewhat common in India, though it is not an easy process as criminal records are not digitised or consolidated centrally. Under current Indian credit rating structures, an individual can obtain information on his or her credit rating. An employer can also access this information with the employee's permission and on providing necessary proof of identity. Access to credit rating information is more common in banks and financial institutions. The termination of employment, whether on a large scale or for a single employee for convenience (and not for cause, such as termination on disciplinary grounds), would be held to be either retrenchment or termination of services, depending on the category of the employee under applicable Indian law. As mentioned in Section I.i, the ID Act applies to an employee who qualifies as a workman. Under the ID Act, retrenchment would mean termination of a workman's contract for any reason other than as a punishment by way of disciplinary action. serve notice to the appropriate government. From a practical perspective, many companies do not provide this notice (especially where only a few employees are being retrenched) because they fear that this may lead to enquiries by the labour authorities. However, not providing the notice would be a violation of law. For establishments employing at least 100 workmen, prior approval would need to be obtained by the employer from the appropriate government before effecting retrenchment. The notice period requirement to the workmen would increase to three months. The government may enquire into the reason for the proposed retrenchment and give the involved parties an opportunity to be heard. Approval for the retrenchment would be given only after such hearing. the employer can provide valid reasons from deviating from the requirement. An employer should have reliable and sufficient evidence to justify the deviation from the rule, preferably in the recorded employment history of the employees. An employer is not required to provide any alternative employment to retrenched workmen. However, a retrenched workman has a right to priority in case of any rehiring, where an employer is required to first offer employment to those workmen who were retrenched by it and are citizens of India. Notification of employee representatives is not required in case of retrenchment unless there are recognised employee representatives or a trade union and the agreement with such body or union requires notification, especially in case of large-scale retrenchments. From a practical perspective, an employer would hold a meeting with the impacted employees or workmen and explain the termination requirement to them, and thereafter commence with the formal retrenchment process. Notwithstanding the provisions of the ID Act in relation to retrenchment, if a workman's employment agreement has better termination provisions (such as a longer notice period or severance pay), the employer would be bound by the same. The SEA may specify a notice period to be provided to all employees, including non-workmen. For example, under the SEA in Karnataka, an employer is required to provide one month's written notice or wages in lieu thereof for any employee who has been in continuous employment for six months. Further, the employment contract would need to be examined for termination of non-workmen and related severance conditions. In practice, an employer may ask for the resignation of the employee rather than terminate his or her contract. Most employees are willing to resign as it is a face-saving method for them to leave the company. If this method is resorted to, this should not be a reason to deny the employee any due compensation under the law or contract. The above rules may not apply to termination of an employee because of misconduct. For example, the SEA in certain states (including in Karnataka) mentions that the notice period requirement need not be followed if the employee is being terminated for misconduct. Termination because of misconduct would occur in the event of a breach of the rules of the employer or some objectionable conduct. An employer can provide detailed rules in the employee manual or appointment letter of what an employee can and cannot do in the workplace. issue an order of dismissal. An order of dismissal may be challenged in a labour court and, if it is found to be flawed, the court has the power to order reinstatement with continuity of service, back wages and consequential benefits. An employment contract would normally mention a notice period or payment in lieu thereof for termination of employment other than for misconduct. In the case of senior management this is likely to be three months, and in the case of other employees this would be one month. In practice, at the time of termination, the employer would check whether the compensation payable under law is more than that prescribed under the contract. under the transfer terms or otherwise, in the event of future retrenchment, the new employer is legally liable to pay the workman compensation on the basis that the service has been continuous and not interrupted by the transfer. If the new employer does not comply with the above conditions, the workmen who have been in continuous service for one year immediately before the transfer are entitled to notice and compensation as if they were being retrenched. Though not specifically provided under the ID Act, case law provides that transfer of workmen is not automatic and the employer should obtain the consent of the workmen. If a workman refuses to be transferred, then the current employer has the option to terminate the contract by way of retrenchment. With the focus of the current government on major employment legislation reforms, it will be important to see how the changes play out over the next few years. The overall outlook is very positive, with a move to increased digitisation of processes, and transparency in compliance and governmental interventions. 1 Debjani Aich is a partner at Kochhar & Co.
2 The term 'workman' is not gender-specific. 3 Each state has a High Court with superintendence over all courts and tribunals in the state. 4 The Supreme Court of India exercises original and appellate jurisdiction in relation to employment laws. 5 There are state-specific modifications, such as those seen in Karnataka, where the IESO Act will apply to industrial establishments with 50 or more workmen. Further, states can exempt the applicability of the IESO Act to certain sectors. For example, in Karnataka, the IT and ITES sector is exempt from the IESO Act. 6 'Continuous service' generally means working in an establishment for 240 days in the immediately preceding 12 months.